Slobface is creating Art, Illustrations and Monsters! Hello everyone, thank you so much for visiting my patreon! This patreon is currently pretty much a tip jar! donate/sub if you would like! 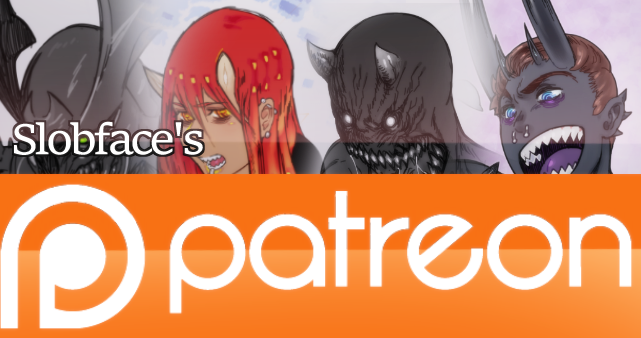 PSD's/ are now available for all Patrons! My name is Slobface. But, you can call me Slob! I love creating expressive monsters and illustrations through digital and occasionally traditional mediums. I'm generally known online for my love of drawing demons and Oni's! A little about me: I've been drawing my whole life, using it as a way to vent and cope with my depression and anxiety. I got serious about art once I graduated high school a few years back and realized drawing was more than just a coping mechanism for me, it made me happy! Ever since then it's been a goal of mine to be able to support myself through my art. whether it was completely or partially to help with bills and every day expenses. Your support means so much to me and I look forward to providing even more art for you! -You will be able to see all extra content I post! Supporting me through this Tier means you want to take that extra step! -This is if you'd like to support me just a bit more! Wow! Choosing this Tier means you must really believe in me! -This tier includes all previous rewards, but is for those that want to support me even further! - Special hand drawn "thank you" cards for every 5$ and up Patreon! - +1 Piece of guaranteed art each month!